First - The Washington Post has started a new Blogwatch column. Recently named as blogs to watch: Girl Meets Glamour, The Peak of Chic, Style Court, Mrs. Blandings, and Things That Inspire, among others. Congratulations to you all! 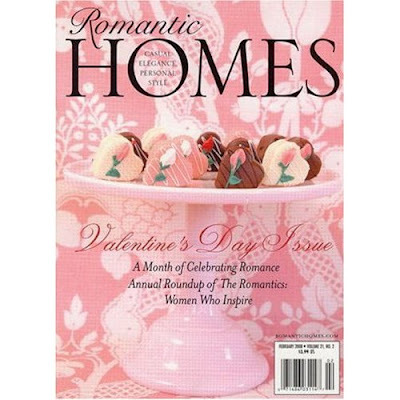 Romantic Homes, did a feature on Jennifer and things she finds romantic for their Valentine's Day issue. Pick up a copy to see what makes her life romantic, though she confessed to me that her life really doesn't feel too romantic these days. Who's does? And, Canadian Patricia Gray of the blog Patriciagrayinc was featured in this month's Canadian House and Home magazine. Patricia gives her New Years resolutions - including the promise to buy "fewer things, but better quality." I watched her try to live up to that promise in Dallas last week. Not sure she's following through after almost buying out the shoe department at Nordstrom's. But, she's trying! Topsy Turvy writes on design from her home in Tampa, Florida. Her blog is bright and interesting, written through the eyes of an interior designer. It is peppered with beautiful photographs on home, fashion and jewelry design. Topsy is busy getting her house ready for a photo shoot and I'm anxious to see the finished pictures. Topsy wrote this entry on geishas which featured pictures of subtle and exotic beauty. Another entry featured pictures of all white subject matter. These snow pictures capture the still beauty of a gray, winter day. Another entry by Topsy featured hand crafted jewelry, including this blue coral necklace. Isn't it stunning? I would love to own it! Be sure to visit Topsy Turvy if you haven't already. Another new blog is Julie Neill's, Bayou Contessa. The French Quarter of New Orleans with its typical silk curtains and antique furniture. And here is Julie's Elizabeth chandelier, one of my favorites (wonder if the name has anything to do with it?). More wide than long, it makes a great choice for lower ceilinged rooms. And lastly, ever wonder what Anna Spiro of the luscious blog, Absolutely Beautiful Things, looks like? Anna recently posted a photo of herself for the first time and wow - she's looking great - all tanned from the Australian summer sun while we suffer with winter! ABT is one of my favorite blogs of all time. It was one of the first ones I ever read and so I have a special affection for all things Anna. Her pictures are always dreamy and truly are absolutely beautiful. Never, ever has she written a word of negativity - it's all positive on ABT and that's refreshing to say the least. For Anna's 30th birthday, she set the table with white daisies. Isn't this the cutest table ever? Notice how she ties her napkins into bows. Another tablescape by Anna, this one in her beach house in Australia. I love the shells in a basket. Anna's style is all about bright colors such as hot pink and kelly green. Joni - what a great update! We are a fun crew, aren't we? Anxious to see the recommended new blogs - it's always fun to have new neighbors. Watching the post tomorrow - I bet you're next. Thanks for the mention. Awww, Joni, thanks so much. You're the best! And I so appreciate your support. Your article in the Houston magazine is still one of my favorites!! Oh, and congrats to Girl Meets Glamour, Peak of Chic, Style Court, Mrs. Blandings, Things that Inspire & Patricia Gray! What a nice review Joni! So generous of you. Great introductions too. Congrats to everyone. Oh, that table with the daisies is one of my favorites of all time. I would be so thrilled to have such a beautiful and memorable table at a party thrown in my honor! Oh Joni, this is so sweet of you to include me with such Design Blog Hierarchy! I love every one of the blogs listed here! Congrats to GMG, POC, SC, Mrs B, Patricia & TTI!!! You all are so deserving of such an honorable mention and welcome to Topsy Turvy & Bayou! I've been enjoying both your blogs of late too! Great blog finds... I always get the Post on Thursday to see who's featured. Also at Thursdays at 11:00 EST, the Home Section writers do an on-line Q&A that is great! Hard acts to follow but I am determined! Each of you never cease to inspire me! LOVE all the blogs mentioned, especially look forward to yours! I have been lurking here for months....reading and enjoying all the above mentioned blogs and ladies. Guess I need to join the blogging ranks....soon as I figure out how to do it!!! Congratulations to all the Bloggers mentioned in the Washington Post and to Peak for being voted Best Design Blog. Romantic Homes looks like a beautiful magazine. Welcome Topsy Turvy & Bayou Contessa to the Blogosphere & Anna of ABT is as lovely as the beautiful Blog she writes. And Joni the tribute would not be complete without Kudos to you for all that you are and all that you contribute to us through your Blog. You continually amaze and inspire me. How very kind and considerate of you to do write this Post to acknowledge all of our contributions and recognition. I am so happy to be part of this amazing Blogging community. Another great post from you - this time a fabulous up-to-the-minute of who's who in design blogland! Thank you also for the mention of a couple of unknown blogs to me. Anna's website was the first one I ever visited and through it I have been introduced to the wonderful world of blogging....I agree it's an absolutely fabulous blog...but look where it has led me !! To you!! It looks like I have another fav blog. to add to my list !! Thanks so much !!! Thanks for the fabulous introduction of my blog. But most of all, thanks for your encouragement and friendship. I am having so much fun working with you, too! You are an abslute goddess of design blogging! Congrats to all others mentioned for the recognition. Design blogging is definitely where it's at. Joni, you're the greatest. We have to organize a blogger girl trip to NOLA in the near future!